Today over at MAWTT, the creative Heidi is hosting with a sketch and Christmas theme, so here's a chance to add another card to your collection. Honestly it won't be long before we have to start writing them all and posting them out. The sponsor this week is Little Claire's and we were each given a stamped image to wotk with. This is a real cute one and with Heidi's sketch I have kept it fairly clean this time. I painted the image using DIs and a little silver alcohol ink. The DP and matching vellum paper were a freebie from a magazine last year - I honestly don't know which one. I have edged with DI and stardust stickles. 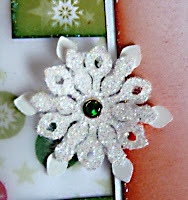 The snowflakes were cut on photograph paper on the cricut and glamour dust added to the top layer & a green gem sticker added to the middle. A simple card, but I really like the end product. Enjoy the weekend coming up. Gorgeous hun, just love your colouring & those DP are fab! Good morning Brenda, beautiful card! I like the colour you have sponged around the image....it really adds. Also, I like your new blog header...my goodness your are really getting into the spirit. Cute - gorgeous snowflake! Thanks for playing with Speedy's Friends! Hi Brenda, wow this is so very special, its PERFECT. What a lovely card! The color you used is pretty! All the details are perfect! Brenda, this is a very pretty card. I love the design and the image. 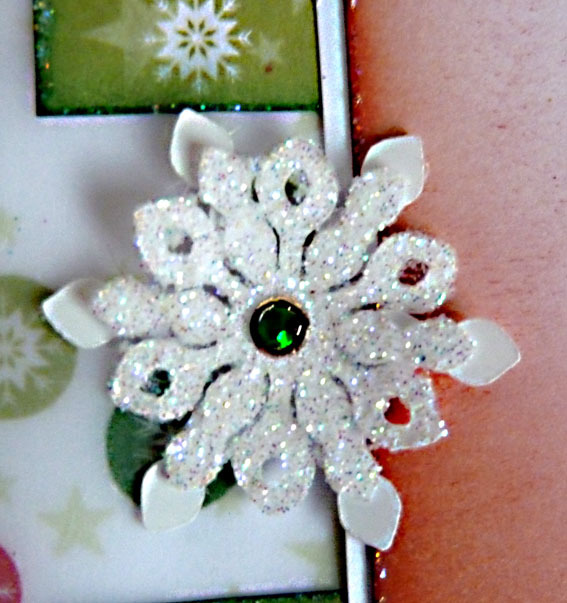 Thanks for joining us at The Crafty Pad this week. Fabulous card Brenda!! Darling image!! So pretty! Love all the Glittery shine! Thanks for playing along with the Cupcake Inspirations this week! Such a gorgeous creation! I love it! I love this bright cheery image. 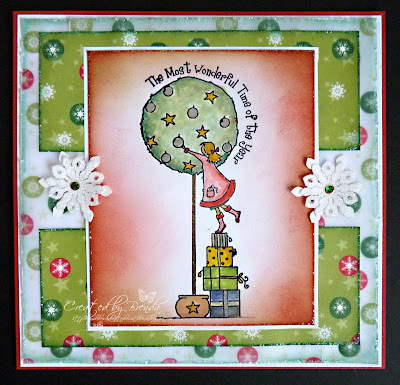 Thanks for joining the challenge at Sweet Stampin this week. That's lovely and what a gorgeous image. Thanks for taking part at The Crafty Pad this week. A lovely card, thank you for joining us at Ellephantastic. Brenda, this is a beautiful card, I haven't seen that Little Claire Stamp before and it is so nice.